Using the right personalized marketing items and promotional gifts is vital to your business achieving its full potential. Additionally, customized display units, marketing gifts and promo items can be utilized to take your brand to new heights. To be a successful business in today’s world you must harness the power of brand exposure and awareness by selecting the ideal marketing items and display units for your target market. Always ready to guide your route to success, our Mindsparkz team provides amazing design and work closely working with our team of merchandisers to locate low-cost sourcing with the best manufacturing solutions in China, Japan and across the world. We provide the most personalized marketing items & promotional gifts solutions. Get in Touch and experience more refined marketing merchandise for your business. We regularly quality check our personalized promotional gifts, marketing promo items and display units to maintain only the highest standards. Frequent factory visits help us make certain that all our products meet your expectations. Our customized promotional gifts, personalized marketing items and promo items are made from the finest materials to meet your business needs. Creative graphic and product designers are waiting to present you creative wonderful new ideas for your next customized campaign. You just need to envision your personalized marketing items and promotional gifts and we will render you the solution. 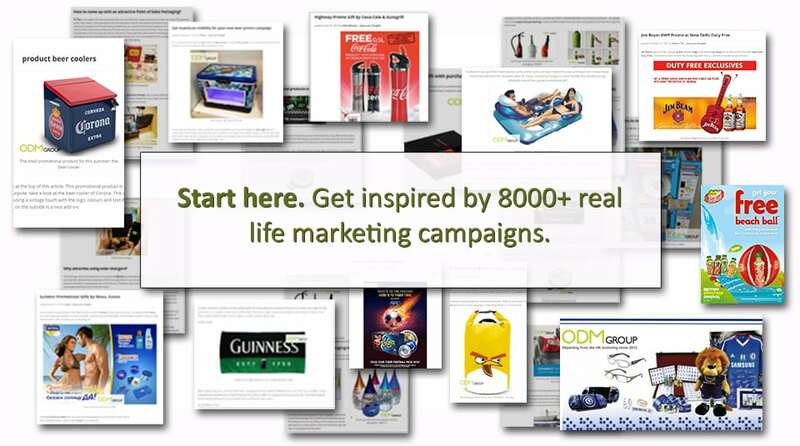 With over 8,000 case studies from around the world (that you can read on our blog), you can see our history of expertise in amazing marketing products. You can see many of the personalized marketing items and promotional gifts, we have made for every type of business you can imagine. By effectively incorporating, personalized promotional gifts, marketing items, marketing gifts and display units into your strategy, you can take your business to new heights of success. ODM is committed to providing the best possible personalized marketing items and promotional gifts. Our Mindsparrkz team can provide beautiful and functional product designs and our experienced marketing professionals will make sure that everything is in alignment with your business needs. Collaborate with us today! And, do check out our blogs for fresh new ideas. Below are some of our favourite personalized marketing items and promotional gifts case studies. Isn’t it a child’s dream to own anything Minion from Despicable Me? Well you can! 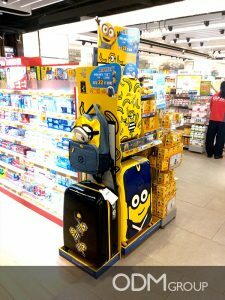 In Hong Kong drug stores there is a free standing POS Despicable Me display that is marketing the third movie. If you need help with free standing POS displays and other marketing tools, contact ODM. Check out this awesome gift froma Paulaner, a German beer brand. Paulaner started a campaign with their bottle caps this summer. 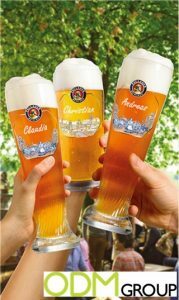 They are offering a free personalized glass with your name on it when buying their beer. If you need help with personalized marketing gifts, contact ODM today. Isn’t it magic when a POS promotion gets people sharing? 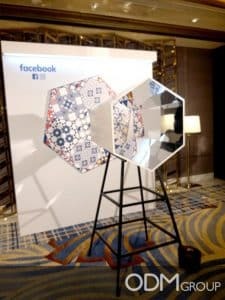 This Facebook unit was shown at a technology event in Macau. Even with no staff coaxing you to stop by it is a great success. What’s interesting is that it takes place regardless of how vintage or modern the structure is. If your curiosity lies in the latter, though, check out this kaleidoscope display. Contact ODM to learn about how we can help you create a well-structured promotional display for your business. Get support shown for your company with this eye catching marketing gift! 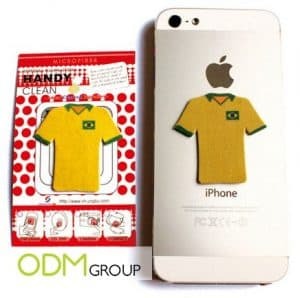 An excellent opportunity to show your company logo on a customisable micro-fibre cloth. 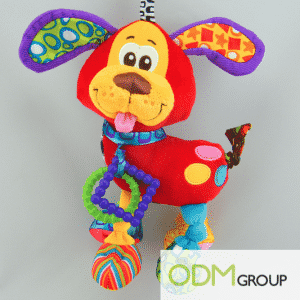 Get in touch with ODM to learn about how we can help you create eye-catching marketing gifts for your company! Here are some adorable and useful marketing gift ideas that both parents and child are sure to love! These promotional gifts will surely help your brand gain daily exposure and develop stronger brand exposure. Contact ODM to learn how we can help you create amazing marketing gifts for your business. The beverage industry is highly competitive so marketing gifts are highly important way of withstanding market strength. Simple and effective marketing gifts may include a beverage glass, whether you enjoy champagne, fruit juice or a glass of water you will always be in need of a proper glass. Why not use a creative marketing tool to do this? 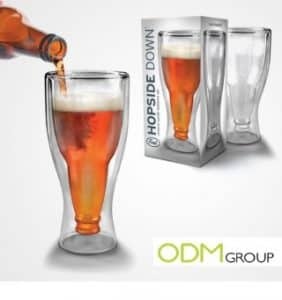 Contact ODM to get innovative corporate giveaway solutions, bottle glorifier and top-rated personalized marketing items.